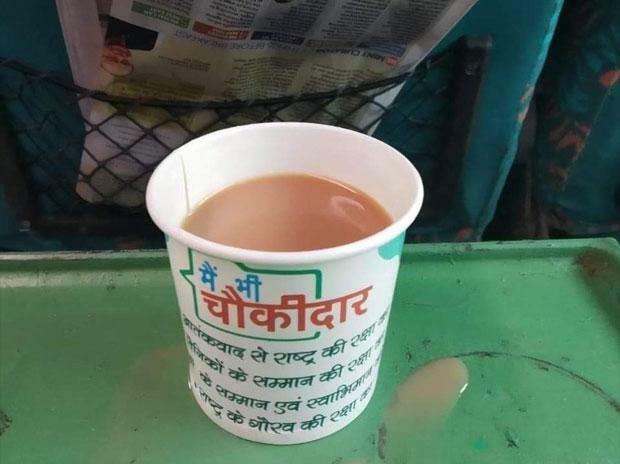 The Railways found itself caught on the wrong side of the model code of conduct yet again when passengers on Friday reported that tea was being served in paper cups with "main bhi chowkidaar" ('I'm also watchman') written on them. As the image of the paper cup tweeted by a passenger on Kathgodam Shatabdi went viral, the railways said its has withdrawn the cup and penalised the contractor. This issue comes days after the railways was found in violation of the poll code for issuing tickets with Prime Minister Narendra Modi's pictures on them. Later, the railways said that it was an "unintentional and inadvertent mistake". "Reports that tea has been served in cups labelled as "main bhi chowkidar" have been investigated. This was without any prior approval of IRCTC. Explanation has been sought from supervisor/pantry Incharges over dereliction of duty. "A fine of Rs 1 lakh fine has been imposed on the service provider. A showcause notice has also been served to the service provider for this misconduct," an IRCTC spokesperson told PTI.